Motorcycle Adventuring wants to become a total resource for riders and with this article a new segment is being introduced that will focus on tour operators and riding. Vacationing in Indochina it is still an “unknown” for most Westerners, the possibility of a motorcycle adventure in Vietnam simply unthinkable, but I must say that if you subscribe to this notion you will quickly learn that you are wrong. Agreed, exploring Indochina on a motorcycle may not be high on the radar for some, but for others it is an excellent way of exploring a frontier region like Vietnam. This is a place where few holiday travelers have been to, especially on a motorcycle. It is an adventure that really peaks my interest. This is where a genuinely first-rate outfit like Explore Indochina comes in. I spoke with Digby Greenhalgh of Explore Indochina, who lives in Hanoi and has been riding Vietnam for 18 years, about his company. Explore Indochina knows what adventure riders are looking for and they deliver with fantastic tour options that can be built around your schedule. Their expertise of the region enables you to safely enjoy an adventure that is very unique and the price is all-inclusive. Rates are very reasonable ranging from $150 to $200 per day. These pioneers of motorcycle tours in Vietnam and Laos have carried out extensive research and have found the best locations to visit. 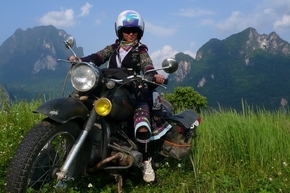 You and your expert guide will use vintage Russian Urals 650cc motorcycles to journey down the Ho Chi Minh Trail, maybe explore the northern mountains of Vietnam, visit with hill tribes, or take cross border trips into neighboring Laos. They even offer dirt bike rides through the jungle in Laos on Russian Minsks 125cc bikes! Riders will enjoy their adventures on these ex-Soviet military bikes. Explore Indochina has the largest motorcycle fleet available of any motorcycle tour operator in Vietnam. Touring is done on the 650cc Urals. The Urals have what is best described as a classic feel with raw torque it is a Russian version of WW2 era BMW. The tough and light Minsks is a 4-stroke 125cc bike that has been modified to deliver serious off-road fun. The fleet is supported by a team of expert mechanics that are on hand for any repair problems. Your touring aspirations will become reality on the road and everywhere else! Explore Indochina did just that for BBC Top Gear’s Vietnam Special in 2010. They provided complete support insuring a production and tour success. I saw the episode and it was a good one! Vietnam is a beautiful county, but there are also some harsh realities. This country is known for its remarkable mountain vistas, deep green valleys, spectacular karst rock formations, and seemingly unending rice paddies. The ravages of war have slowly faded into the past and Vietnam is becoming an economic powerhouse, but poverty is prevalent and impacts the children hardest. This is where Blue Dragon’s Children Foundation lends a hand by taking aim to break the poverty cycle for the poorest children and their families. Explore Indochina is a principal sponsor and organizer of Rally Indochina which raises money for Blue Dragon. The charity directly receives 40% of the per person Rally fee, with the remaining 60% covering the actual cost. Money donated helps to provide a range of services to children such as education, shelter, and medical care. The next Indochina Rally is scheduled to start on 9 April 2012 and finish up on 21 April 2012. “The next rally will have 26 650cc Urals, many will be 3-wheel rigs, you can’t use your own bike” said Greenhalgh. The Indochina Rally makes a greatly appreciated contribution to Blue Dragon. The funds they raise go toward rescuing trafficking children and providing essential relief to their families and communities. Rallying with a conscious sounds like a great thing to me! Take a look at this for more information on the upcoming Indochina Rally. When it comes to picking a tour operator the numbers say it all! The testimonials are all very positive and people just keep coming back to Explore Indochina. Over 11.3% of their clients are return riders and a full 36.4% result from word of mouth recommendations! More than 1,500 people on over 400 rides have toured with Explore Indochina and they have been featured in over 40 international magazines, newspapers and TV shows. Explore Indochina is the first of many tour organizers that Motorcycle Adventuring intends to review, if you have comments about this operator or another please let us know.